Be the first to share your favorite memory, photo or story of Ret. US Army SSgt. Robert. This memorial page is dedicated for family, friends and future generations to celebrate the life of their loved one. Ret. US Army SSgt. Robert “Bob” B. Steele of Belton, Missouri was born on July 10, 1933 in Kansas City, Missouri the son of Harry B. Steele and Very M. (Forrester) Blanton. He departed this life on Sunday, February 3, 2019 at the Beautiful Savior Home, Belton at the age of 85 years, 6 months and 24 days. On October 20, 1956, Bob was united in marriage to Joyce Norene Gaston in Garden City, Missouri. Bob attended school in Belton and moved to Garden City in 1946. He had a distinguished military career retiring in 1973. Bob was a loving father, husband and grandfather and will be greatly missed by all. Besides his parents, he was preceded in death by 8 siblings. Bob is survived by his wife, Joyce N. Steele of the home; two sons, Robert E. Steele and wife Cheri, Archie, Missouri, Jerry A. Steele and wife Kim, Belton, Missouri; a daughter, Krisanne Clark and husband Chuck, Belton, Missouri; 5 grandchildren; 10 great-grandchildren; other relatives and friends. Funeral services will be 2:00 p.m., Saturday, February 9, 2019 will Military Honors to follow the service at the Dickey Funeral Home, Harrisonville, Missouri. Family will receive friends from 1:00 until 2:00 p.m. Saturday, February 9, 2019 at the funeral home. 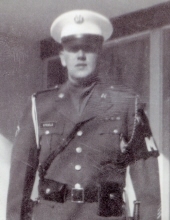 Family suggests memorial contributions to the Disabled American Veterans. To plant a tree in memory of Ret. US Army SSgt. Robert "Bob" B. Steele, please visit our Tribute Store. "Email Address" would like to share the life celebration of Ret. US Army SSgt. Robert "Bob" B. Steele. Click on the "link" to go to share a favorite memory or leave a condolence message for the family.